One 8' SHORTI Lite ContiPad. For bladder weakness and leaks or moderate menstruation. Topped with bamboo velour, with an organic cotton/hemp core. One 8' SHORTI Lite Minivivi ContiPad. A specially designed pad for bladder weakness and leaks. This pad can also be used for moderate menstruation. Topped with bamboo velour. The core of this pad is organic cotton/hemp blend jersey, for the fast absorption and it has a hidden pul layer. This pad is backed with grey charcoal impregnated microfleece for smell reduction. They have a snap tab for arthritic hands to undo snaps easier, they're just under 3" between the legs, with two wing settings to suit different underwear. This pad is approximately 8" in length and 2.75" at the gusset. Colourways will vary. 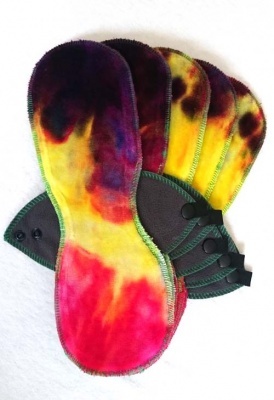 Hand-dyed pad, each pad is unique. Holds up to 60ml once pre-washed. Handmade in the UK by Minivivi. Wash up to 60c. Minivivi recommend washing with a colour catcher as they are hand-dyed. Once prewashed, to wear the pad, place the grey side down against your underwear with the longer end at the front. Then fold the wings round the gusset and snap together underneath. There are two size settings to suit different widths of gusset and you can adjust the position of the pad by sliding it forward or back once you have pulled up your underwear. If sitting or lying down for longer periods, you may prefer the longer end of the pad at the back. To remove the pad, reach under the gusset and unsnap the wings, there is a special tab to make this easier to do. You can then fold the pad and pop it in a wetbag/waterproof bag or container until ready to wash. Do not soak your pads as this may damage them or reduce their lifespan.